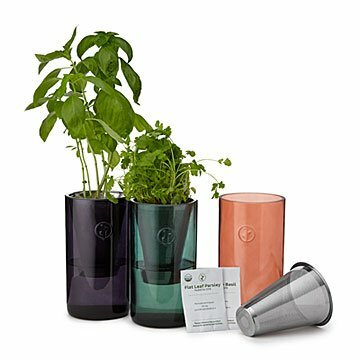 These colored glass planter kits contain all novices need to grow and enjoy indoor plants in small spaces. The joy of indoor gardening is hard to beat, but it's not easy to reach when you 1) don't have a clue what you're doing, or 2) live in a small space. Sarah Burrows and Nick Behr's super-simple, space-saving gardening kit comes with everything you need, and requires neither watering nor worrying. Plant the seeds, pour in some water, and put the elegantly tinted glass planter in a windowsill or another sunny spot. Passive hydroponics and Mother Nature do the rest. Soon you'll have fresh herbs or beautiful flowers, and that unbeatable joy. You didn't really lack a clue, just the right kit. Comes as a set of two seed types, and can be replanted. Choose Genovese Basil and Parsley (indigo), Cilantro and Thai Basil (emerald green), or Pansy and Zinnia (coral). Made in Illinois. Click here for Planting Instructions & Tips.